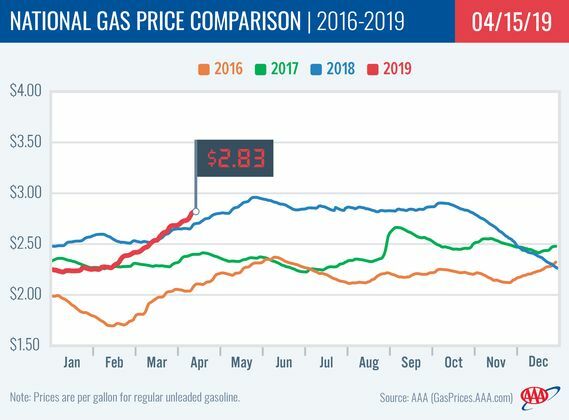 The average price for gasoline across Northeast Ohio is six cents cheaper this week at $2.595 per gallon, according to AAA East Central’s Gas Price Report. This follows weeks of increases; in fact, compared to the beginning of March, the average across the area is 27 cents more expensive. With a dime or more increase, Missouri (+12 cents) and Kansas (+10 cents) had the largest one week increases among all Great Lakes and Central states. Within the region, gas prices range from $2.94 in Illinois to $2.60 in Missouri. In Ohio, the statewide average for gasoline is two cents more expensive this week at $2.68. Gasoline stocks have been consistently tightening in the Great Lakes and Central States since last January. At that time, stocks measured at 61.5 million barrels, but the latest Energy Information Administration (EIA) report shows total levels today at 52.2 million barrels. This – as well as regional refinery maintenance and the switchover to summer-blend gasoline – have caused pump prices to jump as much as 43-cents in the last month in the region. Pump prices on the West Coast increased as much as 20 cents this past week, driving the national average up nearly 10 cents to $2.83 on the week. As stocks tighten out West due to unplanned and planned maintenance, California’s average jumped to $4.00, the most expensive state average this week and a price point not seen in the Golden State since July 2014. Nationwide, as gasoline supplies decrease and demand measures at summer-levels, gas prices are also increasing throughout the rest of the country. At the close of Friday’s formal trading session on the NYMEX, West Texas Intermediate increased 31 cents to settle at $63.89. Oil prices increased last week, and will likely continue their ascent this week, as a weaker dollar helped to push crude prices up because of the increased number of dollars needed to purchase crude on the global market. Another contributing factor to the price jumps came from reports that there was a 534,000-b/d decline in crude production by OPEC members in March. The news underscores that OPEC and its partners are making reductions in service consistent with their 1.2 million b/d production reduction agreement, which is in place through June.